TD Insurance is hosting its second annual competition where students and recent graduates are asked for their ideas on how the company can improve society and community life. The four categories for the challenge are ideal working environment, helping the most vulnerable, safer cars and homes, and reducing environmental footprint. Teams of two to five people can submit their project online by Oct 21, and there are also teams looking for more members. The winner of last year’s contest, aimed at "transforming the Insurance industry using IoT and big data," came up with the idea for "a smart home box that facilitates the lives of people suffering from Alzheimer's and their families." 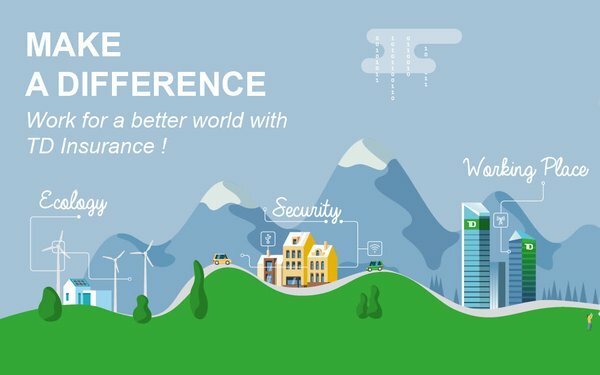 "We aim to make the world a better place and we believe the key to being successful is placing the human at the center of our design,” says François Langevin, associate vice president, product innovation, general insurance at TD, in a release. Leveraging the power of crowd-sourcing enables the company to able to gain access to a “massively diverse volume of human experience that not only changes the way our staff look at our products but significantly reaffirms our lofty and altruistic objective,” Langevin adds. The company is partnering with Agorize, an open innovation challenge platform known for hosting student challenges, startup challenges, and hackathons across the globe, to conduct the contest. Agencies NWRK and The Confluence are handling details of the contest. Agorize created a 30-second teaser video to promote the contest. The three-stage process starts with each team presenting their idea in five slides using the presentation template. Submissions will be judged on their innovation, feasibility and relevance. Top three teams will be announced Jan. 18 and will travel to the company's Toronto headquarters Feb. 19 to pitch their solutions to a team of TD Insurance product management and innovation experts. Each member of the winning teams will receive $2,700 CAD for first place, $800 CAD for second, and $500 CAD for third. TD Insurance works in general insurance and life and health insurance and has offices in states across the United States including New York, California, Florida, New Jersey, Massachusetts, Washington DC, South Carolina, Connecticut, New Hampshire, Maine and Vermont.